Pamplin Media Group - BREAD & BREW: WE ALL SCREAM FOR ... CHICKPEAS? BREAD & BREW: WE ALL SCREAM FOR ... CHICKPEAS? Micah Camden ate with reckless abandon while opening burger places, pizza shops, and ramen houses all across Portland, and now proclaims, "I love dairy and I love gluten, but they don't love me." "When I go in, I really go in," he says. And at Super Deluxe, his Southeast Powell Boulevard drive-through, he went way, way in. "I'm 145 pounds one day, then it takes off, and three or four months later I'm 165 pounds." His waistline expanded as fast as his empire. At 39, Camden had a heart attack. It was time to change. "I love, really love ice cream, but I could no longer have it," Camden says. In search of a fix, he bought pints of vegan alternative ice cream products, like non-dairy Soy Delicious and Almond Dream, only to be disappointed. "I couldn't eat the things I love, and it was really eye-opening." Enter Little Bean, 1241 N.W. Johnson St., the latest addition to Camden's family, which includes Little Big Burger. 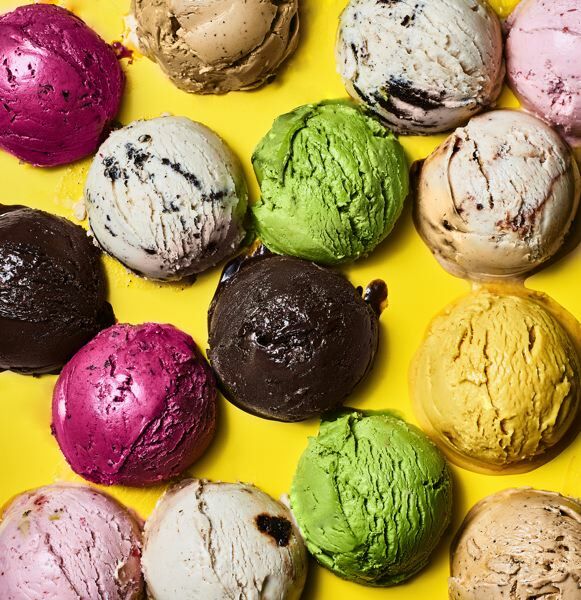 Here, the non-dairy ice cream, gluten-free waffle cones and baked goods are made with chickpeas. It's a stunning vegan experience, one that feels a lot like gluttony. 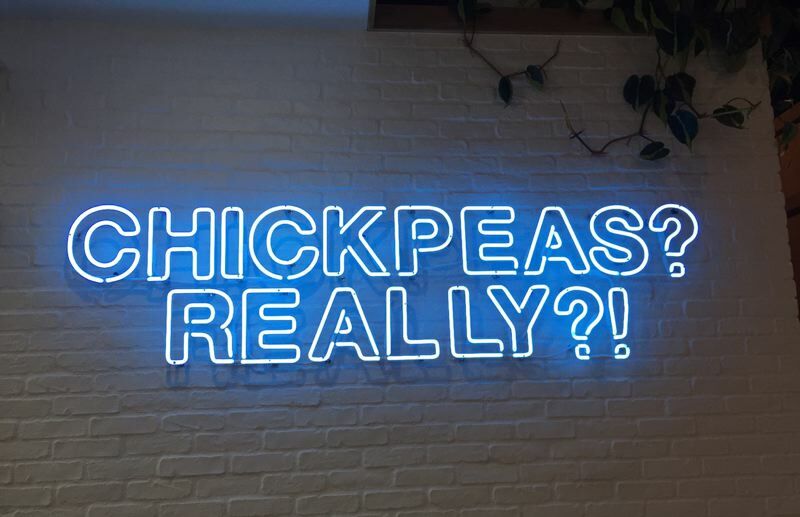 An Instagram-ready neon sign asks, "Chickpeas? Really?!" It is kind of genre-bending. Pints to go are $8. Waffle cone scoops are $5.25. Cones come in regular, matcha and chocolate flavor. And then there are the "ice cream" flavors themselves. We tasted Cherry Chai, Szechuan Strawberry, and Blackberry Basil. Asked if he could eat only one for the rest of his life, Camden says he'd pick Schezuan Strawberry. Second would be orange-caramel because it reminds him of the Flintstones Push-up Pops of his childhood. His chickpea affair began when he visited Miami two years ago. "I was coming off an unhealthy period, and I ordered a smoothie. One of the ingredients was chickpeas — they just opened a can and poured them in with other the other hippie stuff. That planted a seed in my head," Camden recalls. Chickpeas, he explains, are the third-oldest crop in the world dating back to the time of Jericho. They're drought-resistant and cheap. Until now, chickpeas, aka garbanzo beans, are best known as the key ingredient for making hummus. Says Camden: "Everything in the vegan world is basically made of soy, and I just don't like soy. Ninety percent of it is owned by Monsanto, and they're the devil." He's referring to the mega-agricultural biotech company that grows Roundup-resistant crops. Blech. Applying a similar process as the one used to make soy, it became obvious right way that he was onto something. Early batches, he recalls, definitely tasted like chickpeas but through trial and error the taste was perfected and he harnessed the power of the chickpeas. The result is so good no one will know it's not ice cream. Camden knew he had to move fast to bring chickpea ice cream to market. "It got to the point that I really was paranoid. We blacked out all the windows of our test kitchen and it was a race to be first," he says. Now he orders truckloads of chickpeas from a Washington farm and staff members haul in bags weighing more than they do. Asked if we'll see Little Bean shops in every quadrant of the city, Camden says no. "We don't want to be Salt n' Straw. We just want to be in Portland, and be in grocery stores" — specifically, he says, New Seasons Markets. Little Bean is really for families who aren't pouring as much cow's milk into their kids as earlier generations. "Knowing what dairy did to me, I wouldn't put it in them either," he says. 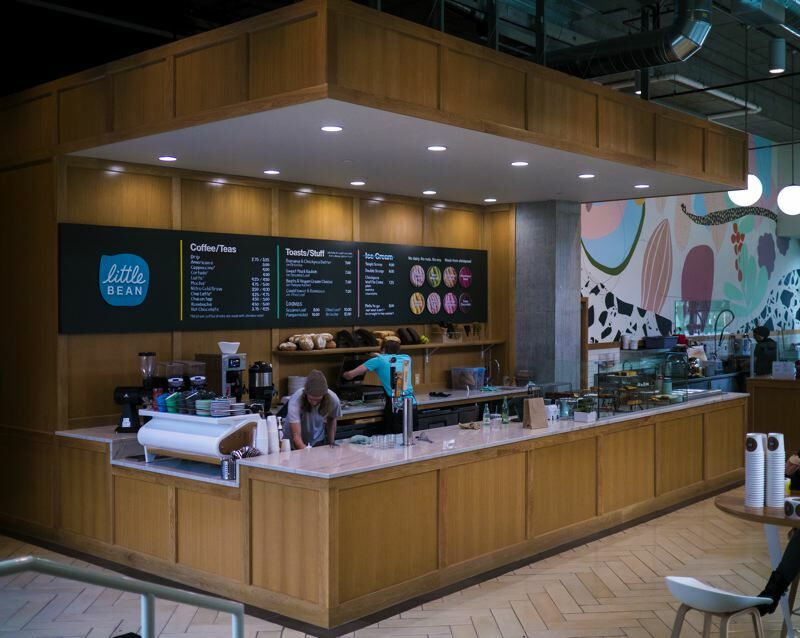 Not to miss at Little Bean is the beautiful selection of gluten-free baked goods, all made with chickpea residue, the stuff leftover from making ice cream. "Did you try the cookies? They're so chewy," Camden says. "Put them out uncovered on the counter for four or five days and they're still amazing." For now, just consider chickpea ice cream a really lovely gift to Portland. One that tastes all the sweeter because we almost didn't get it. "As I was developing it I talked to a few local food writers," Camden says. "I told them I was ready to go with it in L.A. And they said if I opened this in L.A. that I would be so dead. And they were right. This has Portland all over it."